How will I receive my eTickets? These are electronic tickets that will be delivered to you via email. Where can these eTicket be used? 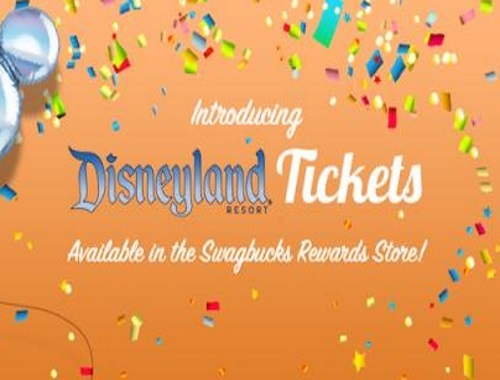 These eTickets are specifically for use at Disneyland Resort in Anaheim, CA, and cannot be used at Disney World in Florida, or at any Disney Stores or other Disney resorts. Tickets cannot be used for admission to special events (ie. Mickey’s Halloween Party). What type of eTickets does Swagbucks offer? What happens if I redeem for the wrong ticket? These eTickets are non-refundable. Please make sure you are redeeming for the correct ticket and pay close attention to the type of ticket you are selecting, as there are different tickets depending on the amount of days you wish to attend the park, the type of ticket (one park per day vs. Park Hopper), and the age range the ticket is for (adult vs. child). Adult tickets are for ages 10 and up. Also, please keep in mind it may take a few business days for you to receive your eTicket, so be sure to give yourself enough time when redeeming before you plan to visit the park.